… at the American Museum of Natural History in New York. 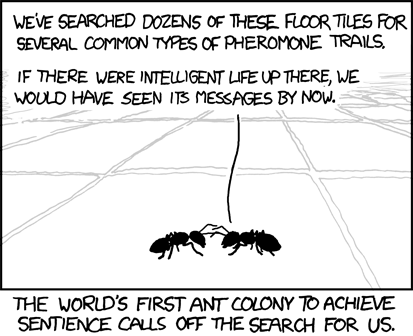 via xkcd – A Webcomic – The Search. I don’t think there is any argument about the fact that ants are the coolest creatures to ever put foot on this planet insects around. But in case you are still not convinced just think about all those insects that either try to look like ants or make whatever possible to hang out with the cool. On that note, Taro Eldredge is a former Cornell University undergrad that just moved to the University of Kansas to start graduate studies and just moved his blog to WordPress (btw, what would be the opposite of a double wammy?). His research interest is in staphylinid beetles of the sort that live as guest of ant and termite colonies. 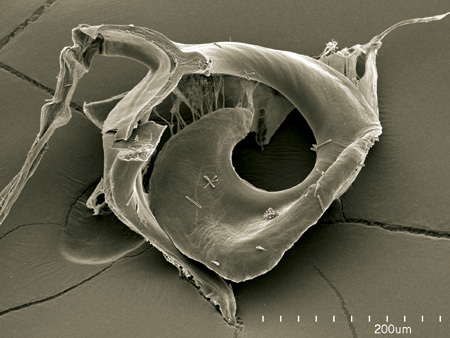 Check out his blog at Myrmecoid – ?????? I have a strong feeling the following editorial in this week’s Proceedings of the National Academy of Sciences (PNAS, USA) is in direct response to the (backstage) outcry generated over publication policies by the publication of the peculiar paper communicated by Lynn Margulis just over three weeks ago (for example here). To clarify, I don’t have an opinion on the issue of publication policies used by the National Academy of Sciences. As of July 1, 2010, PNAS will no longer allow the submission of papers “Communicated” to the journal by NAS members and will instead handle these papers as Direct Submissions. Authors are free to ask an NAS member to edit their paper as a “Prearranged Editor” prior to submission to PNAS. Assignments are handled by the Editorial Board, and members who agree in principle to edit a paper are given special consideration by the board. NAS member contributions are not affected by this policy change. You can read the full text at PNAS’ site. It is a wonderful photograph, but what really caught my attention is the author’s description of it on the published caption. They are Formica ants or “wood ants”. Can’t tell which species from here. via CIWEM Environmental Photographer of the Year 2009 competition winners – Telegraph. Update September 16th, 2009: A friend of mine ask me if the ants were really parachuting and if I had heard of this behavior before. The answer was that I had never heard of this before, but my guess is that the ant just pulls the seed out forcefully and falls to the ground, seed in mouth, as it looses her balance. A beautiful accident. I reject the Darwinian assumption that larvae and their adults evolved from a single common ancestor. Rather I posit that, in animals that metamorphose, the basic types of larvae originated as adults of different lineages, i.e., larvae were transferred when, through hybridization, their genomes were acquired by distantly related animals. “Caterpillars,” the name for eruciforms with thoracic and abdominal legs, are larvae of lepidopterans, hymenopterans, and mecopterans (scorpionflies). Grubs and maggots, including the larvae of beetles, bees, and flies, evolved from caterpillars by loss of legs. Caterpillar larval organs are dismantled and reconstructed in the pupal phase. Such indirect developmental patterns (metamorphoses) did not originate solely by accumulation of random mutations followed by natural selection; rather they are fully consistent with my concept of evolution by hybridogenesis. Members of the phylum Onychophora (velvet worms) are proposed as the evolutionary source of caterpillars and their grub or maggot descendants. I present a molecular biological research proposal to test my thesis. By my hypothesis 2 recognizable sets of genes are detectable in the genomes of all insects with caterpillar grub- or maggot-like larvae: (i) onychophoran genes that code for proteins determining larval morphology/physiology and (ii) sequentially expressed insect genes that code for adult proteins. The genomes of insects and other animals that, by contrast, entirely lack larvae comprise recognizable sets of genes from single animal common ancestors.